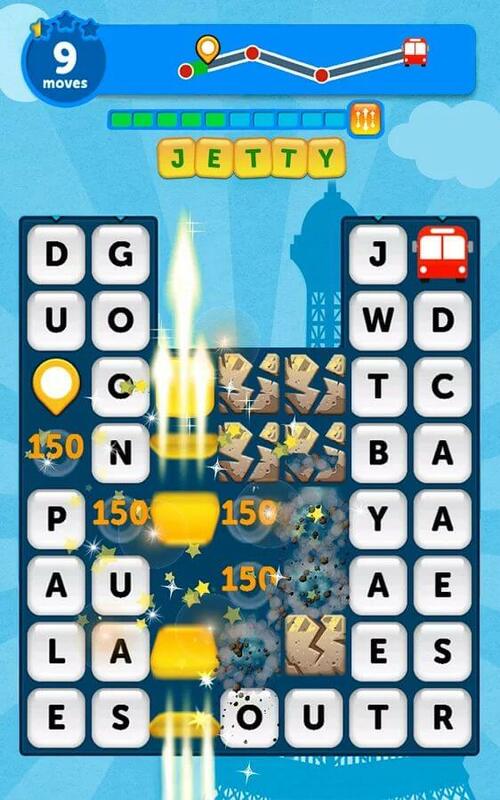 Words on Tour (WoT) is Zynga’s newest word puzzle game. Inspired by games like Ruzzle, WoT tests your vocabulary and spelling ability. New in this game is the inclusion of exotic locales. While playing WoT, you will travel throughout the world, learning new words and phrases. The game map offers trivia about each new destination. Just tap on a flag beside a level to learn more about a landmark, building or history of a country. The game is divided into zones with complex levels. However, there are some ways to finish levels and you do not have to use any boosters to do that. These tips and tricks will help you complete levels faster, earn more points and become a better player at Words on Tour. Make longer words to collect more tiles. You have limited moves to complete your objective and so you should build words containing more than 3 letters. You may have to collect 30-40 odd tiles and creating shorter words will only waste your moves. There are no time restrictions. Also, words can be created by swiping in any direction. Your goal must be to create at least 4 words per move right from the start of play. When searching for a word in a grid, look for its plural form. Sneaking in an extra letter “S” lets you collect an additional tile in one move. Besides the 25 free tokens, you get additional tokens if you connect to Facebook. These tokens can be used to purchase power-ups. You will find unlocked power-ups at the bottom of the screen. Don’t use them on easy levels. Save them for harder levels. The game will show a tutorial on how to use a power-up. Don’t worry; you don’t spend any tokens when using a power-up in the tutorial mode. You will still have those 25 tokens intact. In “Find the Phrase” levels, the objective is to discover a hidden phrase by building words. As you build words, letter tiles appear in a grid at the top of the screen. Once you figure out what letters are needed to complete the phrase, start focusing on building those words that contain the missing letter(s). Because you have very few moves with you, it would be wiser to create 2 or 3-letter words containing the missing letter. The bonus meter fills up as you make words. The longer the word, the faster the meter fills up. Once the bonus meter is full, a special golden letter will appear on the grid. Making words containing the special letter will trigger a line blast, destroying all words horizontally or vertically. Carefully note the lines drawn on the special letter tile. Vertical lines indicate all letters lined up vertically will be removed. Horizontal lines indicate all letters lined up horizontally will be destroyed. Diagonal lines will trigger a line blast destroying all letters diagonally. The special tile not only lets you earn bonus points, but also allows you to collect extra tiles. With these special tiles being triggered, you can collect extra tiles and fill up the hidden phrase grid at a faster rate. Can’t unlock a new zone? Complete objectives in a level faster to collect stars. The stars you have collected will be used to unlock a zone. The quicker you complete objectives, create longer words, the more the chances of getting a three star. Try filling up the bonus meter to get the special letter. Make longer words with the special tile to trigger line blasts and and remove several tiles/obstacles at once. This way you will fill up the star meter at the top-left corner of the screen faster. Other ways of unlocking a zone include asking Facebook friends and spending tokens. The simplest way to unlock zones is stars. You can replay levels in which you earned only 1 or 2 stars.